To subscribe or unsubscribe, email info@PathologyOutlines.com, indicating subscribe or unsubscribe to Case of the Week.� We do not sell, share or use your email address for any other purpose.� We also maintain two other email lists to receive a biweekly update of new jobs added to our Jobs page, and to receive a monthly update of changes made to the website.� You must subscribe or unsubscribe separately to these email lists. 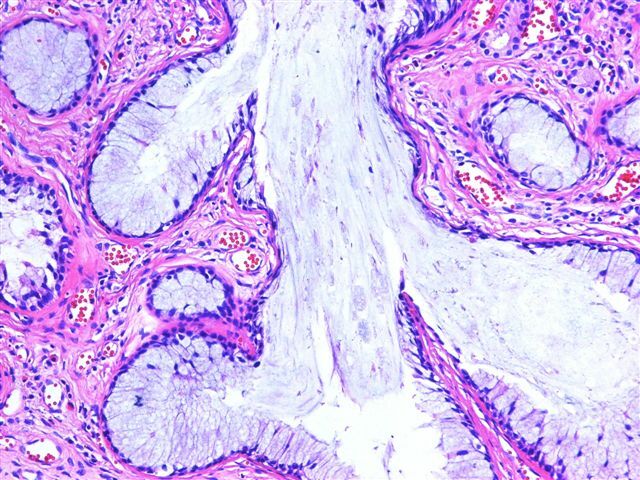 A 43 year old man with a history of chronic sinusitis developed nasal obstruction.� On examination, a unilateral polypoid mass was located in the right posterior nasal cavity in contact with the nasal septum.� At excision, it measured 3 x 2 x 1 cm, was solid and soft, and had the gross characteristics of a nasal polyp.� Microscopic examination shows a glandular, organoid, florid proliferation of tubular glands lined by ciliated, respiratory-type epithelium and goblet cells, without nuclear atypia (Figure 1, Figure 2, Figure 3).� The stroma is edematous with inflammatory cells and eosinophils, similar to an inflammatory polyp (Figure 4). 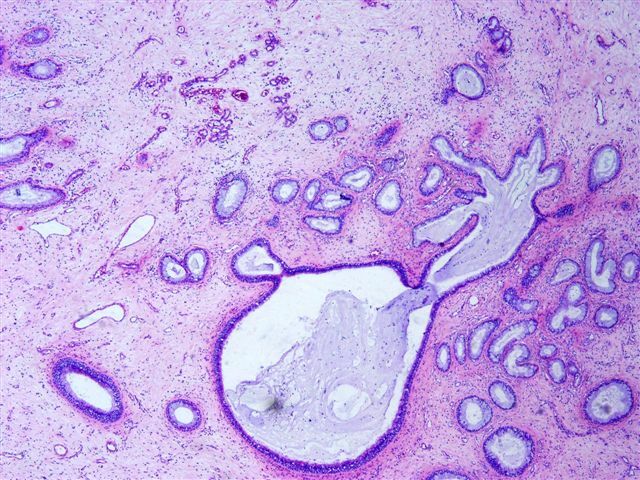 Some glands have mucous metaplasia, similar to colonic glands (Figure 5). 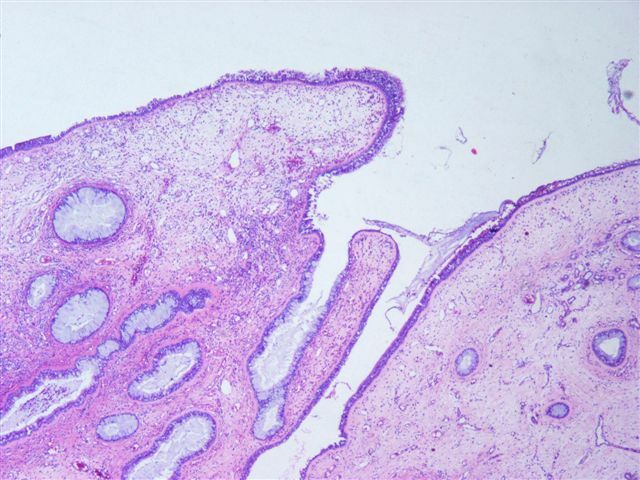 Invagination of the surface epithelium gives rise to ciliated tubular glands (Figure 6).� Some seromucinous normal glands are interspaced with the tubular glands (Figure 7). 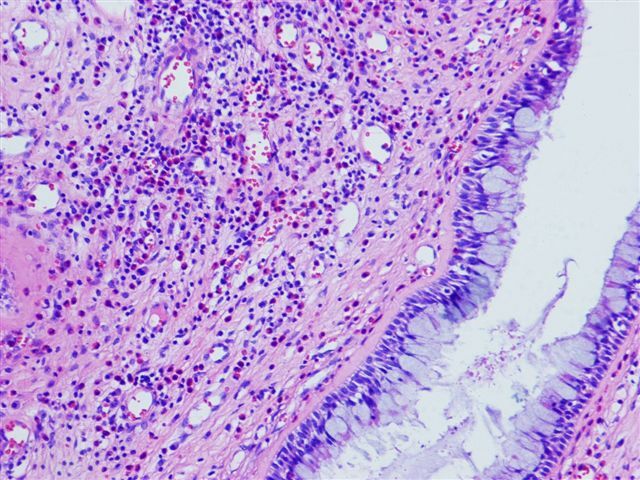 Hamartomas are defined as non-malignant malformations composed of excessive proliferation of one or more cellular components specific to a given tissue. �In 1995, Wenig and Heffner reported 31 cases of what they called "Respiratory epithelial adenomatoid hamartoma of the sinonasal tract" (Ann Otol Rhinol Laryngol 1995;104:639).� Within the nasal cavity, the most common site was the nasal septum along its posterior aspect. �The median age was 58 years (range 27-82 years), and men were primarily affected.� They arise in the setting of inflammatory polyps and their development is likely induced by an inflammatory process. 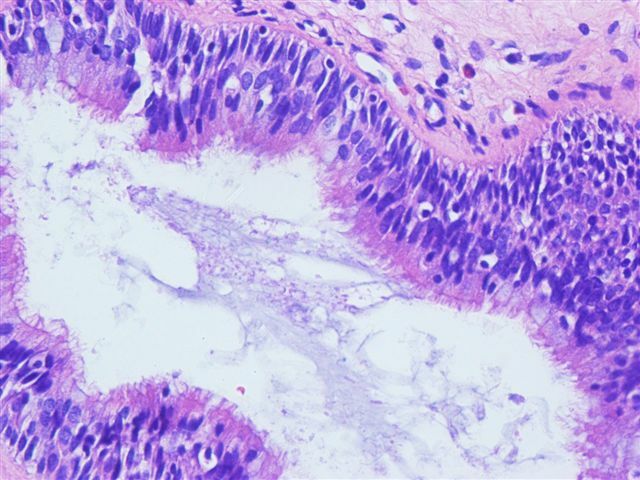 Histologically, the lesions were characterized by a prominent tubular glandular proliferation lined by ciliated respiratory epithelium, originating from the surface epithelium. �The basement membrane is thickened.� No destructive growth is noted.� Surgery is curative, and the lesions do not recur. 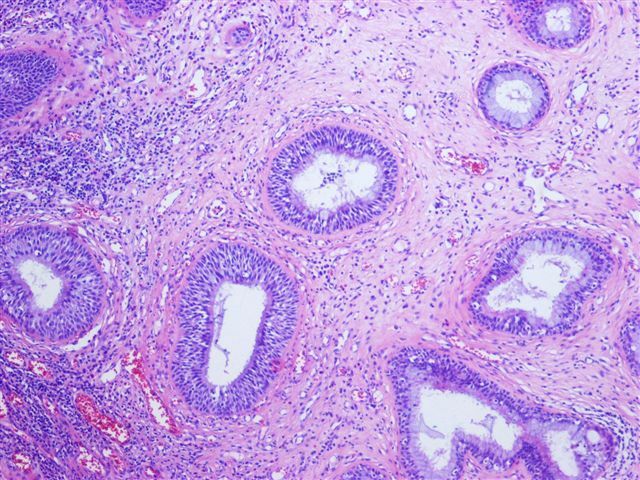 The differential diagnosis includes inflammatory polyps (fewer glands) and inverted schneiderian papillomas (usually hyperplastic squamous epithelium with only a few goblet cells and a thin basement membrane). 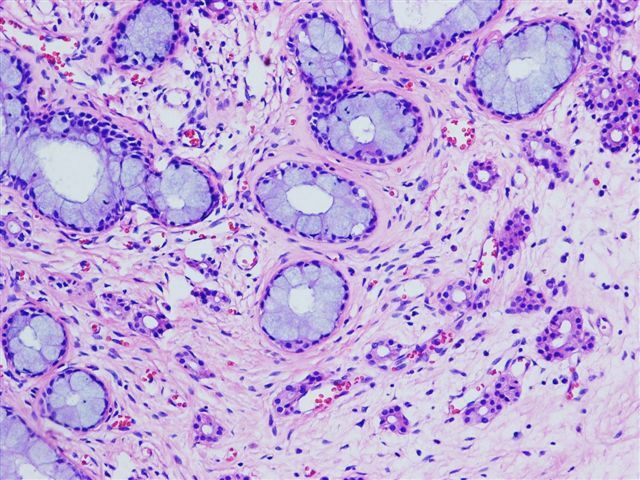 �More important is the differential diagnosis of sinonasal low grade adenocarcinoma, which usually demonstrates a back to back glandular pattern with nuclear atypia, prominent mitotic activity, desmoplastic stroma and perineural invasion.